LOS ANGELES (AP) — Charmian Carr, the actress best known for sweetly portraying the eldest von Trapp daughter in Rogers & Hammerstein's "The Sound of Music," has died. She was 73. Carr died Saturday of complications from a rare form of dementia in Los Angeles, Carr's spokesman, Harlan Boll, said. At age 21, the actress portrayed Liesl von Trapp in the 1965 film version of the musical "The Sound of Music." She famously performed the song "Sixteen Going on Seventeen." After "The Sound of Music," Carr's only other major Hollywood role was starring with Anthony Perkins in the Stephen Sondheim television musical "Evening Primrose." She played a mysterious young woman who lived in a department store. "It's always sad when a member of the family passes away — and in the case of the 'family' of the movie 'The Sound of Music,' it's especially sad when it is the first of the group to go," said Ted Chapin, president of the Rogers & Hammerstein organization, in a statement. 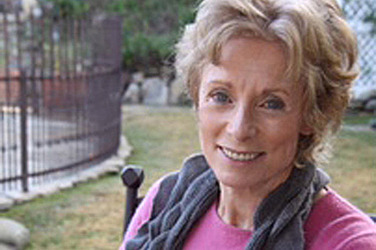 "Charmian Carr played the oldest von Trapp child, and in some ways she maintained that role in real life — guiding, cheering, supporting and generally being there for the rest of her 'sisters' and 'brothers.' "
The actress later wrote a pair of books about her "Sound of Music" experiences: "Forever Liesl" and "Letters to Liesl." She fully embraced audiences' reverence for the musical, frequently appearing at fan events commemorating the film, including sing-a-long performances at the Hollywood Bowl. "I tell people that they should consider sing-a-long 'Sound Of Music' like going to a therapist," she told The Associated Press before a 2005 appearance. "It's just a kind of therapy. They can move around. They can dance and talk back to the screen. They can skip their appointment with the shrink that week." Carr went on to become an interior designer in Southern California. Her clients included Michael Jackson and "Sound of Music" screenwriter Ernest Lehman. "We're second family," said Kym Karath, who played the youngest von Trapp, Gretl, in an AP interview last year to commemorate the film's 50th anniversary. "As adults, we were deeply bonded, so our lives have really interwoven with each other."